Hierochloe odorata is a perennial C3 grass (Waller and Lewis 1979), 30-60 cm tall, colonial from rhizomes, plant fragrant, stems arising from among dead leaves of previous season; fertile stem emerging early in season, withering soon after flowering. 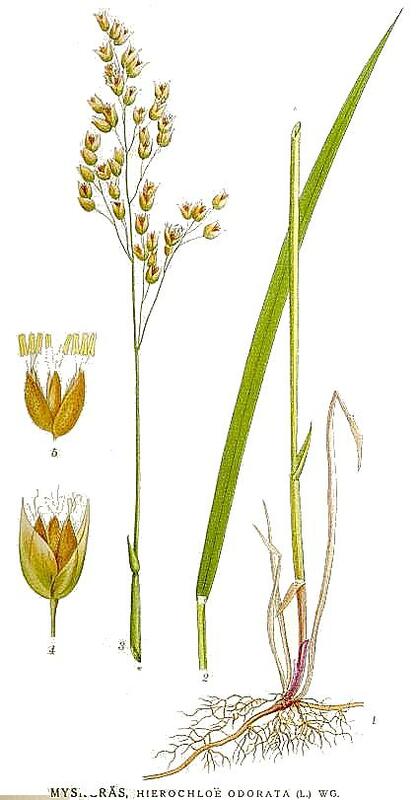 Leaves of fertile shoots with sheaths bladeless or with a few short blades to 3 cm long at most, ligules membranous, 0.1-0.2 cm long, tip rounded, leaves of sterile shoots mostly basal, elongate, 20-80 cm long, rough textured, emerging after flowering stems. Flower spikelets 0.4-0.8 cm long, bell-shaped, gold-green, often tinged with purple, papery, flattened, 3-flowered, without awns; glumes broad, thin, shiny, egg-shaped, about as long as florets, two lower florets male, upper floret fertile, becoming hard in fruit; inflorescence pyramidal, 5-10 cm long, branches widely spreading, slightly drooping; blooms April-May. Often self-fertile or sterile (Norstag 1960). Habitat: Open swamp forests, freshwater or brackish marsh edges, soil pH 5.7-7.4; tolerant of fire, moderately tolerant of salt, shade, intolerant of drought (USDA, NRCS 2010).